One of the less frequently used yet useful reports provided by Google AdWords is Reach and Frequency report. If you advertise using placement-targeted campaigns, AdWords’ Reach and Frequency Performance report helps you see how many users saw your placement-targeted ads and how frequently they viewed them over a period of time. To generate this report, Google calculates data by estimating the frequency of your ads from a sample data and then extrapolating it to a full set of impressions to determine their estimated reach. The report also includes a metric called cost-per-head. The cost-per-head is the average cost for you ads to reach an individual audience. This report will only go as far back as January 1, 2007 and does not include search network. Reports are available for daily, weekly, and monthly time periods, as well as for the cumulative daily statistics (summary). The Reach and Frequency report lets you know how many unique visitors (IP addresses) you have reached, and how many times your ads have reached them. The report provides stats on two main metrics: reach and frequency. In order to increase frequency you need to narrow down your targets, and in order to increase your reach, you need to broaden the networks your ad is showing on. 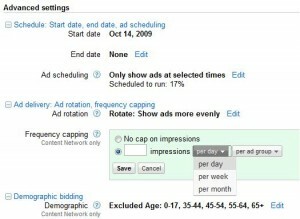 You can use frequency capping setting to limit the number of times your ads appear to the same unique user on the Content Network. You can limit the number of times your ads are served to an individual user per day, per week, or per month by turning on frequency capping for a campaign. 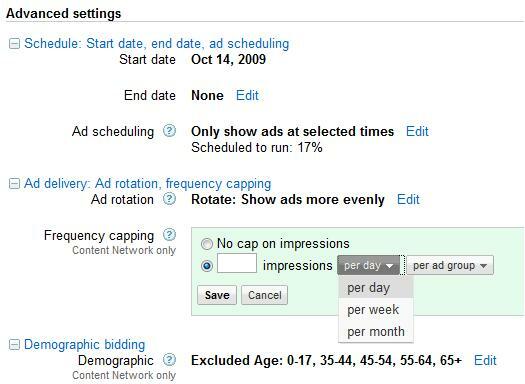 You can also choose if the cap applies to each ad, or to each ad group.